Decisions decisions…how to layout your nursery. 1. Can you put the nursery on the same floor as your master bedroom? This helps when you are making LOTS of trips into baby’s room in the middle of the night. 2. Should you choose the smallest room you have available? We decided to use the smaller room at our house because we wanted to use the larger room as a guest room and storage. Baby doesn’t need much space in a nursery and as long as you have room for the necessities, you might consider using your smallest room for your smallest family member. 3. Do you want baby close to living areas and the front door? For us the answer was “NO” but unfortunately that interfered with our number two plans above. I actually really hate having the nursery be towards the front of our house- our dogs bark at the front door ALL the time and it is the closest bedroom to our living room. No loud movies or dance parties at our house after baby goes to bed! 4. Should baby’s room be close to his/her siblings? This again was a tough one for us. Our nursery is right across from big sister’s room. Luckily my son hasn’t woken her up at night, but she has woken him up during the day by slamming her bedroom door. That’s always fun. I kid you not I LITERALLY hit the period on that sentence and my daughter slammed her dresser drawer in an attempt to get her pajamas out. I had to count to 10 under my breath and pray that my son didn’t hear…he’s still asleep. I can here my husband in there “SHHHHHHHHHHing” her. Maybe we should put her bedroom in the basement?! 1. We placed the large furniture first. Crib went on the largest wall, dresser next largest wall and rocker went next to the crib. When placing the crib, we tried to keep it as far away from the window as possible so baby wouldn’t use the window treatments as an escape route out. 2. If you have a rocker in the room (highly recommend this) try to keep it close to crib. That way you don’t have far to walk when you have a sleeping baby in your arms. Also try to place the rocker in a spot where you can fit a small table or even close to the dresser. This will give you a place to put your phone, a small lamp or a bottle so they are all with in arms reach. 3. Try to keep crib away from door so you don’t wake baby when you are walking out. Placing the crib where you can peek in from the doorway is nice also. 4. Make sure crib is away from bookshelves, dresser, art work…anything baby could knock down or use to climb out as they get older (so much fun!). One of the most useful websites I found for nursery ideas and floor plans was Project Nursery. They have SO much inspiration and great info on their website. They actually do tons of interviews with the designer of the nurseries they display on their site, which allows you to know where some of the major items were purchases and what colors were used! 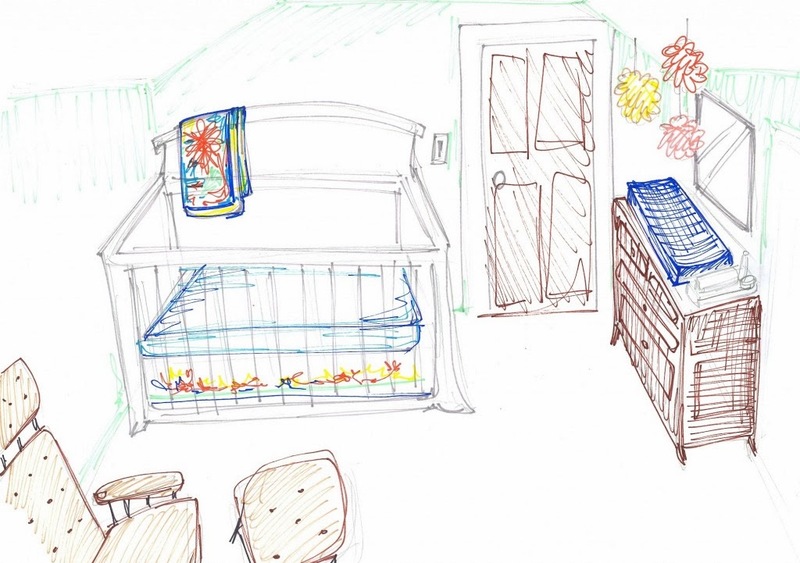 What things did you have to take into consideration when you planned YOUR baby’s nursery?